The trail from Deboche to Dingoche is up and down, with a net gain of 2000 feet. 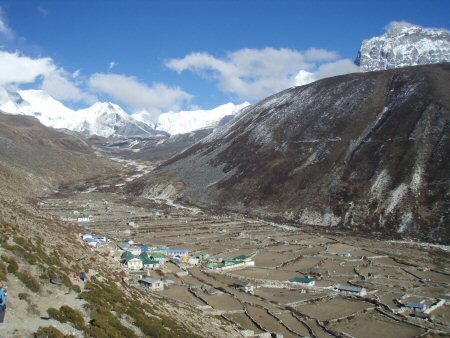 Like before, most of the gain is in the final section, climbing out of the river bottom to Dingboche. This morning was pretty cold, but I dress lightly for the trail, and wound up hiking pretty fast to keep warm. After lunch I could feel that I was coming down with something: my throat was hurting, by lungs were filling up with crud, and my energy was draining out. The change was so sudden: I was hiking easily at the front of the pack in the morning, and then I was struggling just to keep up. 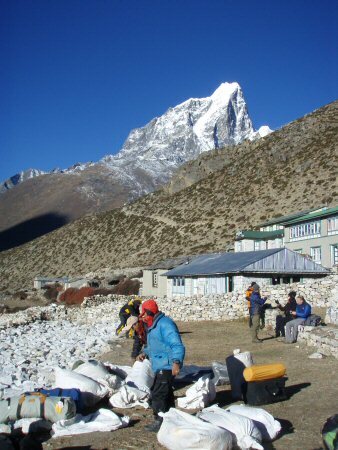 Once we arrived at Dingboche I immediately went to bed and rested until dinner time. Everyone else was chatting, exploring, enjoying themselves (like I was yesterday) but all I could do was lay there. I dragged myself out of bed for dinner, but immediately went back to bed afterwards. The net result of all this rest: I could not sleep at night. Oh well.